Exeter Plumber, Peter Chown, provides a full range of professional Plumbing & Heating services around the Exeter area, from boiler installations, boiler servicing and repairs to fixing dripping taps or replacing whole central heating systems. Looking for a friendly, reliable Gas Safe registered Exeter Plumber? 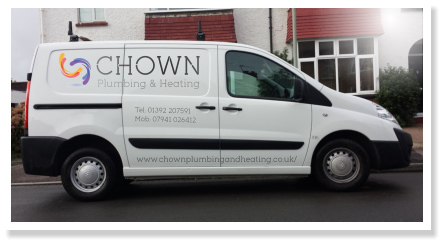 Chown Plumbing & Heating is a family run plumbing business, registered with Gas Safe, a legal requirement to carry out domestic gas work, and has over 20 years experience in domestic and commercial plumbing. Qualified to undertake almost all plumbing requirements on most gas or water systems, Peter is fully kitted out with the latest tools and instruments to ensure that the work is carried out quickly and safely, usually in one visit and will always leave your premises in a clean and tidy state. Chown Plumbing & Heating guarantees to complete the work to the highest standards and leave you with a job to be proud of. So for the services of a reliable, friendly and professional Exeter Plumber, contact us. "We recently renovated our old, dated cottage and Pete did all the plumbing work for us. He installed a new boiler, radiators throughout, two bathrooms and a shower room. Nothing was too much trouble and he certainly knows his stuff. He was reliable, friendly, professional and most importantly reasonably priced. We have had no problems with any of the work he carried out and would highly recommend him to our friends." "Pete has literally replumbed our whole house in the last 2 years...He has reconfigured and plumbed in 3 new bathroom suites, downstairs cloakroom and done work in the kitchen. No job is too big or too small and his prices have been very competitive. Pete has always been on hand to offer advice and direction on the big jobs he has undertaken for us and we have always be very happy with all his work. I would recommend him to anyone and would be happy to supply a reference if required." © CHOWN Plumbing & Heating. Built by Toughfruit.